Xerox 1000i and EFI Digital Storefront at Trevecca Nazarene University. GC: Kelly, let’s start with the type of work you do for the campus. KH: We do everything from tests, syllabi, to full-blown marketing campaigns for prospective students, all the way to some books that we do as well. We can link it into DropBox accounts, which all of our students use. Even the teachers, for tests or syllabi, will throw it out in their DropBox account and the students can decide if they want to print them off rather than have just electronic copies. Or they can come and upload files. GC: And what about the specialty colors your Xerox Color 1000i does? Do you use that capability at all? KH: So, I’m told it’s the only press in Nashville that can do the clear, silver and gold like that, so we actually do a lot of run-off prints for some of the surrounding printers that we’ve built relationships with. 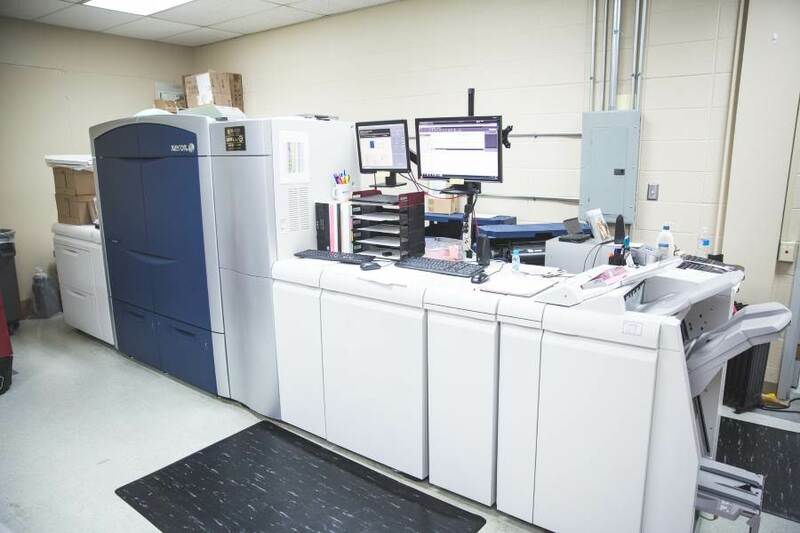 It’s been kind of fun for Trevecca to get our name out in other ways where we’re kind of helping some of the larger print shops that might be a little more expensive to run metallic on the old offset press so they’ll send it to us to run digitally for them. GC: An in-plant with more advanced printing capabilities than local commercial printers is pretty impressive. Now, you also implemented EFI’s Digital Storefront online portal as well. Did you do all this simultaneously? KH: We didn’t launch both of them at the same time. We launched the press and the print shop and we were pretty much pen and paper taking orders that way for five or six months until we got a handle around it. And then I started getting trained on Digital Storefront and it pretty much changed our lives because it helped streamline everything. To come in and building it out and pricing so we’re not having to constantly going back and check everybody’s math. It doesn’t have to be so archaic. GC: How has your staff adapted to the new way of doing business? KH: I have a night time supervisor. She’s part time. And then we staff it with students and basically that helps students get real-world experience that they can take once they graduate. But the other benefit to that is that while they’re working, it helps pay down their loans. And now, with it coming through the front end, we can assign it based upon everyone’s schedule. They come in and they look at their queue and they can see what jobs they need to do. When the kids come in they can take a look and see what’s assigned to them. They usually sort it by due date. They have the job names in here. What products they’re using because depending upon the product it determines the template they’re going to use that we’ve built out for them. And then it shows who’s responsible for it. GC: And all the job ticketing information flows through to the press? KC: Yes, I’m connected to a Fiery. The command workstation lets us talk to the press itself. When it comes into the machine it has instructions and that. And they can come into the JDF settings and they can see small section of it where it talks about here’s the paper that you’re going to use. It tells you the job info. How you’re going to cut. Are you going to repeat it on a page. And then we use MIS details because I run reporting once a month to check and see how the production’s going and how efficient we are. GC: That all sounds good, but how much of your work actually comes through Digital Storefront? KH: About 99 percent of it all comes through the website. GC: Wow, and has this impacted your bottom line at all? KH: Actually pretty drastically. I would say that it’s about almost 50 percent more with the volume. KH: Because people were kind of hesitant. They had in their mind that it’s going down to the print shop, it’s going to be very expensive. But now that they can come out here, it gives them real-time pricing as they go. GC: So, that is good news to your in-plant, but has the university as a whole been impacted? KH: Hundreds of thousands of dollars were saved when we brought the print shop on campus. When we redid it and had the press and merged with marketing. Yeah, it was a huge win for the university. GC: Thank you for the interview, Kelly, and best of luck as you move forward. Here is a link to the interview with Kelly Huebscher of Trevecca Nazarene University, if you would prefer to listen to it.